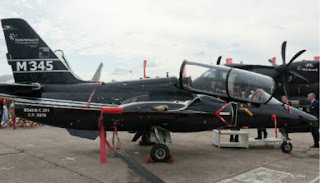 M-345 jet trainer is developed by Alenia Aermacchi for basic-advanced stage of piloting. The new mini aircraft will obviously meet various training requirements of the armed forces worldwide. Based on developments on the M-311 demonstrator, the cost-effective M-345 trainer offers reduced acquisition and lifecycle costs in comparison to heavyweight turboprop trainers. The maiden flight of M-345 was conducted in December 2016 and tests are expected to conclude by 2017. The M-345 HET is an advanced version of the M-345 jet trainer. Alenia Aermacchi and the Secretariat General of Defence/National Armaments Directorate of the Italian Ministry of Defence signed an agreement in June 2013 to jointly develop the M-345 HET. Between 2017 and 2020, the M-345 variant will replace the ageing fleet of MB-339 aircraft currently in service with the Italian Air Force. "The new aircraft will meet various training requirements of the armed forces across the world." The M-345 is a light, tandem twin-seat shoulder wing aircraft. The strengthened airframe offers fatigue life of 15,000 flight hours. It integrates a retractable tricycle landing gear and a single turbofan engine. Improved features of the M-345 include integrated pressure re-fueling and a two-level maintenance concept which minimises operating costs. Together with the trainer jet’s on-board oxygen generating system (OBOGS) operators can reduce the manpower required for ground maintenance, and turnaround times to conduct more sorties a day. The M-345 has an overall length of 9.85m, wingspan of 8.47m, and height of 3.74m. The wing area of the aircraft is 12.6m². The aircraft has an empty weight of 3,300kg and a maximum take-off weight of 4,500kg. The external load carrying capability makes the M-345 suitable for secondary missions. The advanced glass cockpit of the M-345 can accommodate two crew members in tandem configuration. The fully digital glass-cockpit is equipped with hands on throttle-and-stick (HOTAS) controls and three 5in x 7in LCD multi-function displays (MFDs) for instructor and student pilot. The forward cockpit is fitted with a head up display (HUD), while the rear cockpit is installed with a HUD repeater. "Together with the trainer jet’s on-board oxygen generating system (OBOGS), operators can decrease the manpower required for ground maintenance, as well as turnaround times to conduct more sorties per day." Cockpit features include night vision goggles (NVGs) compatibility along with an integrated global positioning system (GPS) or inertial navigation system (INS), digital moving map, and two mission computers. The trainer jet is also equipped with an embedded tactical simulation suite that was successfully integrated on the MB-339 and M-346 advanced trainers produced by Alenia Aermacchi. The aircraft integrates a stores management system (SMS) too. Similarities between the M-345 and M-346 cockpits and the respective training syllabuses will also ensure interoperability during joint training operations. The M-345 is powered by a turbofan engine developing a maximum thrust of 1,600kg (3,500lb) at take-off. The fuel is supplied by an internal tank with a storage capacity of 700kg. The health and usage monitoring system (HUMS) aboard the aircraft provides information on the structure, engine and other systems to monitor the operational status of each single component. The M-345 trainer can fly at a cruise speed of 420KTAS. The certified service ceiling of the aircraft is 40,000ft. The aircraft has a rate of climb of 5,400ft/min. It can reach a distance of 840nm, but the ferry range can be extended to 1,100nm by integrating two external tanks (10% reserve). The aircraft has a limit load factors of +7/-3.5g at 3,300kg take-off weight. The lengths of ground run required for take-off and landing of the aircraft are 460m and 450m respectively.